Update v2.6 Trading Cards, Controller support, & Hex Grids! We have got some great goodies for you. We’re happy to announce that we now have trading cards! So if you’re into collecting, you can now get all the cards, emotes, badges and backgrounds for Tabletop Simulator through Steam! 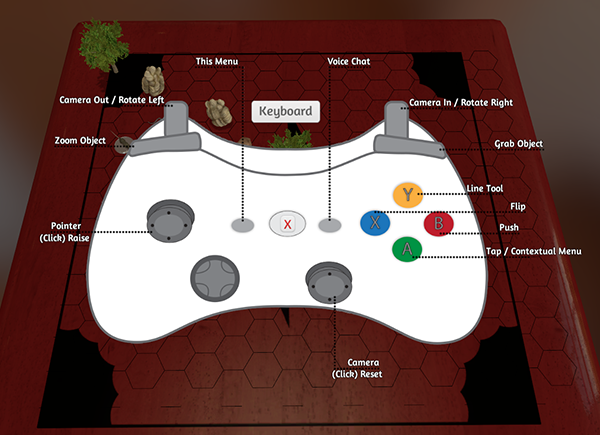 In addition, this update brings awesome support for controllers and hex grids! 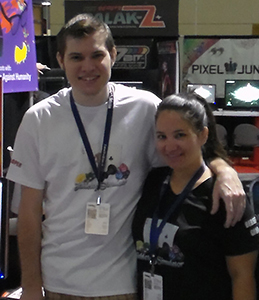 We also had a great time at PAX Prime and it was great meeting some of you from the community! Here’s a picture of the two of us on the first day right before the doors opened. Just like you can control the box grid, you can now create a hex grid. Supports distorted hex shapes by scaling x and y axis separately. 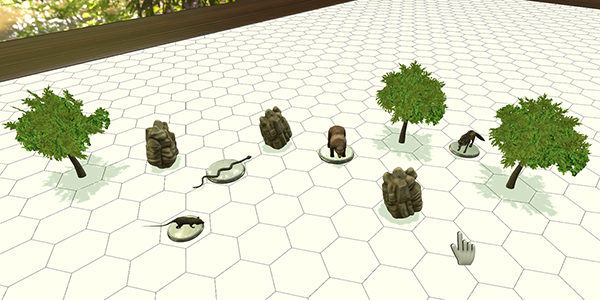 Object snapping support for hex. Rotational improvements allow proper hex control. Xbox 360 controller support has been added. The controller layout can be seen by hitting the ‘Back’ button on your controller. Previous voice chat replaced with new system. This change was due to some players experiencing memory leaks from the previous implementation. Voice chat is now default enabled but can be disabled in the settings. Updated Unity to the latest version v4.5.3f in preparation for supporting the Oculus Rift. Engine update also fixes the issue with fullscreen hosts alt tabbing causing issues for clients. Custom board added under the custom section in the Chest. Each object held now has its own rotation so they all flip to the same direction when picked up. Fixed issue with grid settings not syncing when loading a save/mod for clients. Fixed delay on copy -> paste grid snapping. Fixed issue with 2 max player games not showing up on the server browser. Fixed issue with resetting all cards and cards disappearing. Fixed floating card bug when mousing over and rotating cards layered cards like in solitaire. Fixed alt + reset camera bug causing the camera to bug out. Fixed promoted icon disappearing from players that have changed colors. Fixed possible chat now showing up bug. Fixed alt zoom not working properly on custom dice for everyone except the host. Fixed problem when failing to connect to passworded server then trying to join a server without a problem. Fixed bug that was deleting icons from open chest windows when trying to delete objects. We made a lot of changes in this update, so if you encounter any issues, please post on our support forum.